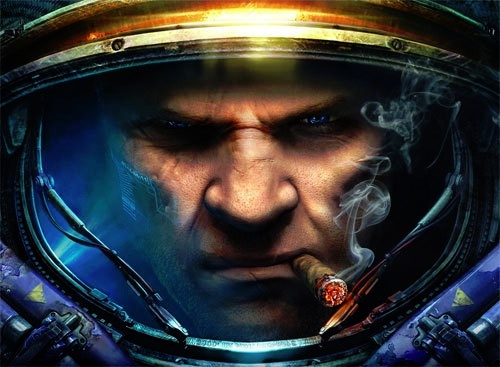 I have a love for a spectacular game called StarCraft 2. It’s a sequel to one of the best video games ever created, made in 1998, StarCraft. To give you an idea of how great StarCraft is – it is a national sport in South Korea. Television stations are dedicated to broadcasting games between professional players on a 24/7 cycle. Think chess but the board is digital terrain, the pieces are infantry, and instead of taking turns everyone moves their pieces at once. You might ask “why are you talking about StarCraft in a post about pumpkins?“ Well there is a good answer. 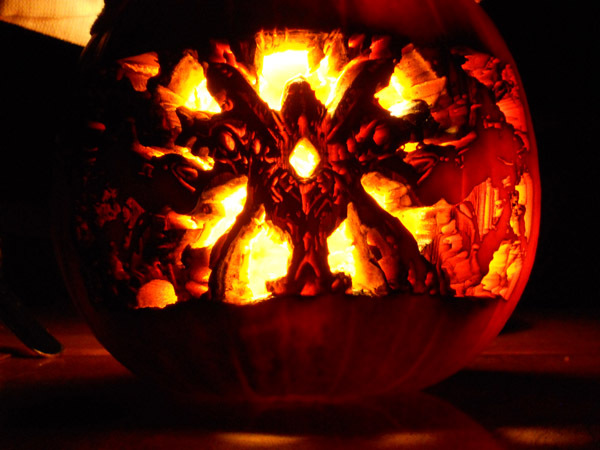 The answer is that Blizzard, the company that created StarCraft, has an annual pumpkin carving competition. This year I decided to give it a shot (spoiler alert: I didn’t win). I’m not crafty and I don’t have any skill when it comes to slicing gords, but I have advantage. You see, I have access to thousands of dollars of equipment! In particular I have access to a laser cutter. A laser cutter is exactly what it sounds like – a machine that uses LASERS to cut things. The lasers are attached to the heads of sharks. I wanted to try this novel technique but assumed that the folks who run the shop wouldn’t be thrilled with the idea of putting pumpkins in their expensive equipment so I let the idea die. 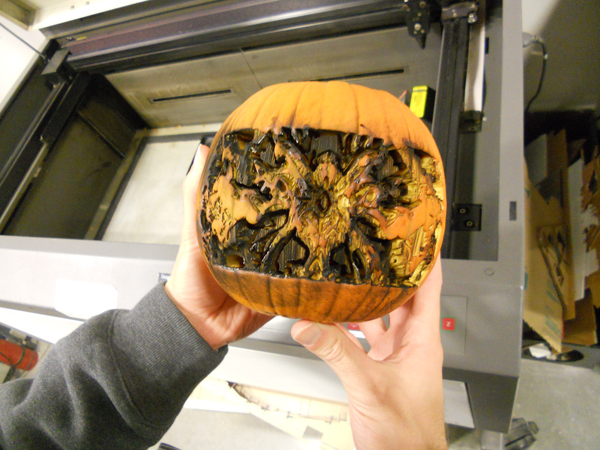 A week later my friend (and fellow Info Eco member) Matt Hirsch found a picture of a pumpkin carved into the death star online and declared his own interest in cutting pumpkins with the laser cutter. This tipped the scales. I rushed out and bought a test pumpkin. Laser cutters cut on two axes. This means they can make cuts in two dimensions. Think of an ink jet printer only instead of putting ink on spot they burn away the material there. The laser is attached to a head, which can move forward, backward, left and right. You put the material underneath it, focus the laser, and let it work magic. Laser cutters are great at cutting shapes out of flat things like cardboard, or sheets of wood, or acrylic. They aren’t so great at cutting shapes in pumpkins. `Luckily our shop has a device that converts round things into flat things – it turns the laser cutter into a laser lathe. Instead of having the laser move forward and backward, the laser only moves left and right, and this device spins whatever it is you want to cut. The cuts themselves are designed digitally as a drawing. You just “print” the picture you want, and the laser will burn away the material to match the image you printed. Of course there’s a bit more to it than that. Vector (i.e. line drawing) images are used to make lines. Raster (i.e. solid shapes) images are used to burn away large areas of material. Vector is far faster than raster, but raster is needed for certain kinds of effects. After gutting my test pumpkin it was time to give the cutting a shot. I didn’t know what settings would work – I wanted to be able to cut through the pumpkin in certain spots, but I also needed to be able to make shallow cuts, since the most fancy pumpkins tend to have different depth cuts in them to create different shades of orange. Cutting through was a breeze, but required very slow settings. The big issue was that because the pumpkin isn’t a cylinder it curves down on the sides. This means that the surface is further away from the laser and so the laser loses focus and intensity as it moves further away from the center (i.e. lines that are closer to the sides are wider and shallower). It was also clear that the bottleneck to this whole process would be pumpkin size. The lathe attachment can’t hold objects that were wider than about 7 inches, so I would only be able to cut shapes on tiny pumpkins. Blast! Since StarCraft has a fan base, there is a lot of artwork out there. I just had to pick one I thought would look good on a pumpkin, and convert the image to a format that a laser cutter would understand. I wanted to try making a pumpkin with four layers. The first layer wouldn’t be cut at all (darkest), the second and third would be different depths of raster art, and the fourth would be cut all the way through (lightest). I used Adobe Illustrator to “trace” the image I had selected. This process converts a full-fledged image into a much simpler one; in my case the new image had only four colors. It's all lit up, oh boy! I was impressed with the amount of precision you could get with this technique, but the small size of the pumpkin meant that I was limited in the amount of detail I could accurately display. I wanted to try again with something a little less involved – the face of Tychus Findlay, one of the main characters in StarCraft 2 and also the image that announced the release of the game several years ago (Blizzard had promised never to make a sequel, so this announcement image is iconic). This one was amazing, but only when you looked at it correctly. Check out the black and white one at the bottom. 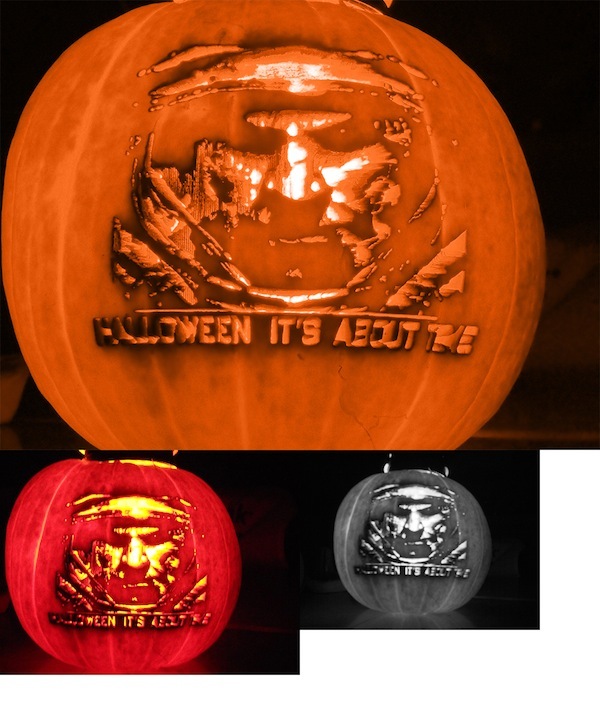 In conclusion, my camera isn’t very good, the pumpkins were too small, and I didn’t have enough time to create original artwork that worked well for this project. As a result, I didn’t even get an honorable mention! I don’t mind, though, because now I know how to make awesome pumpkin carvings for next year!